The Forest River RV FR3 is a class A motorhome that the entire family will easily fall in love with. This is just a taste of what the 29DS has to offer. 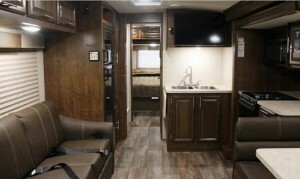 This motorhome is truly a revelation in quality and luxury RVing. Here are just a few of our favorite features for the FR3 motorhome 29DS model that will make you want to buy yours today! Check out the awesome style of the Forest River FR3. Driving the FR3 to your favorite destination is one thing, but when you arrive, this gorgeous model allows you to really stretch your legs by expanding the interior space with two full slide outs. With one in the living room, making for additional living space for your family, and the other in the bedroom, you will have more space than you will know what to do with when you drive this beauty off the lot and to your favorite destinations. No one wants all of their floor space to be dominated by sleeping quarters; and the FR3 fixes that problem with optimized bedding solutions that fold away when they are not in use, giving you more than enough space to do everything that you like inside this awesome class A motorhome. Don’t waste a single square inch of your precious living space! Spacious and comfortable – the Forest River FR3 interior. The FR3 29DS is also optimized to be able to sleep a lot of people with no trouble. With sleeping capacity for up to six people, the entire family can fit in the FR3 29DS with absolutely no trouble. If you love going RVing with the whole family, then you will find no better class A that fits that balance of floorspace, sleeping space, and boundless adventures on the road. There are a lot of reasons that the Forest River RV FR3 29DS floorplan is amazing that we’ve just scratched the surface here! You will need to see these floorplans for sale to believe the amazing features and amenities that come along with them. Come by anytime to check out our new inventory of FR3 motorhomes for sale and ask any questions you may have about why this RV is the perfect model for your next road trip and many road trips to come.